“Sports contact with any country practising apartheid in sports condones and strengthens apartheid” – International Convention Against Apartheid in Sports. J-BIG worked with the Palestinian Boycott National Committee to launch this important new BDS campaign. We urge all supporters to . . . Red Card Israeli Apartheid! ON JUNE 22, UEFA President Michel Platini received a letter signed by 42 football clubs and dozens of team captains, managers and sports personalities in Gaza, demanding that European football’s governing body reverse its decision to allow Israel to host the 2013 international under-21 tournament. The current tournament is drawing to a close in Denmark on June 25. 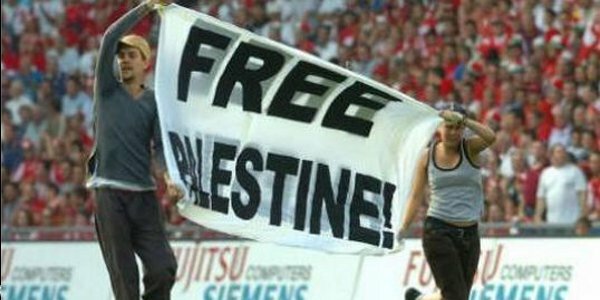 “If this tournament goes ahead as planned, football fans from all over Europe and beyond will be given the impression that Israel is a country like any other, rather than one that practices a unique combination of occupation, colonization and apartheid against the indigenous Palestinian population” the letter argues, before going on to detail the ways in which Israeli Apartheid impacts Palestinian sport. Now it’s up to us to send a clear message to UEFA that its decision to reward Israel for its violations of international law won’t be tolerated.